It's been a heck of a race season in terms of podiums and placings but that's not a very objective gauge since it depends on who shows up to race. I knew my bike and run paces had improved this year but I was less sure of my swim. 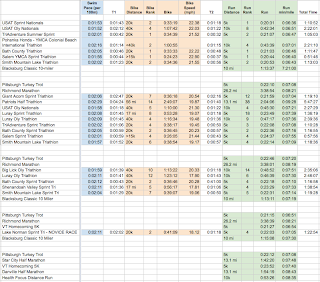 It was time to stop guessing and time to finally collect ALL of my race splits and rankings in a spreadsheet for every race I have ever done. Spreadsheet! Yay!! Very fun! It wasn't too hard considering my first ever race of any kind was just four years ago - a local 10K. I ran it in 53:26, but my mouth ran even faster. I talked a LOT in that race - to other runners, cops directing traffic, spectators. That sure isn't the case any more, I don't say a word (other than "on your left" on the bike course ;-) It's amazing what I can remember from this and every race I've ever done. After painstakingly gathering the data, it became apparent that it can only really be viewed at arm's length. There are so many modifiers - wetsuit or not; pool vs open water swim; bike courses that run long or short; hilly vs flat terrain; weather/time of year; stand-alone run vs tri run; state of health and injuries, and whether I was wearing a turkey costume (!). Then there are the "outliers," like the run at the Patriot's Half, which was not so much a run as it was a mix of 'shuffling' and doubling over from full body muscle cramps. So you see with all the caveats, it wouldn't make any sense to do something like graph all my 5K finishes over time. Of course I did! But I stopped short of running a linear regression model because that would just be nerdy! Suffice it to say the trend is heading in the desired direction. The spreadsheet did provide some evidence of speed gains in all three sports...including swimming! I discovered that my Nationals swims showed marked improvement. Coach Jim made some swim training changes back in June and it seems to be paying off - more frequent swimming, regular open water swimming, and tougher interval work. There's also been a shift in my mentality -- more determination and aggression. If you are like me and fascinated by and motivated by numbers, I'd definitely recommend keeping some sort of race data history; Athlinks.com is a great source for mining your data. In the end, remember -- it's just data, just numbers -- we give it meaning. Collect it up, hold it at arm's length, and draw some general conclusions to motivate and guide your training. Then look at the numbers AGAIN and recognize that EVERY number on there is a victory unto itself because it shows you got out there and did it!